Waterfront, Rivers Edge Condo #1D-Bldg 1 *PRIVATE DOCK and ASSIGNED BOAT SLIP! These modern, picturesque, waterfront condos features a floating aluminum dock with a designated boat slip for each unit and a private ground floor tackle storage locker for anglers. For those looking to kick back and relax, start your mornings off watching the sun rise with coffee on the scenic balcony overlooking the scenic Steinhatchee River before unwinding in or around our riverfront pool. Unit features a king size bed in the master bedroom, two queen size beds in the guest bedroom, in addition to a full size sleeper sofa in the living room. Each bedroom and living room comes complete with its own television. 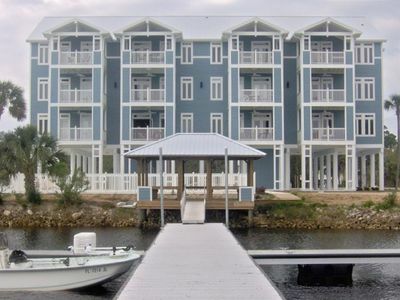 Conveniently located just one mile from the Gulf of Mexico (five minutes by boat) on the south side of the river, condo units are situated right next door to Good Times Marina, which carries all of your fishing, boating and scalloping supplies. Good Times Marina also houses the “Who Dat Bar and Grille,” where you and the family can enjoy great food and beverages – including cooking your catch at the end of the day! If you love scalloping, fishing, or just relaxing on the water, this is definitely the place for you!